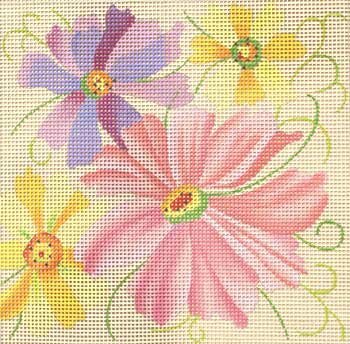 This easy to stitch traditional floral by JulieMar & Friends is on 7 mesh interlock. The design area measures 12 x 12 and is a needlepoint project suitable for a beginner stitcher as well as those with more experience or failing eyesight. The design is hand-painted onto 7 mesh interlock so that it is easy to stitch. This traditional Cosmos floral design comes with or without fibers. If you select cotton we will send DMC Perle. For wool or silk we use Planet Earth fibers which are single-ply and easy to stitch with. If you would like to mount your canvas onto stretcher bars to keep it taut while stitching we recommend two pair of 16" stretcher bars and thumb tacks.